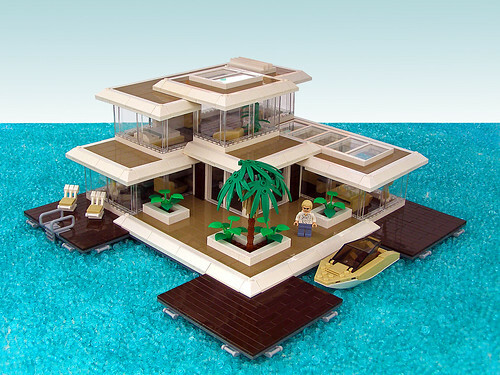 Brick Town Talk: Whatever Floats Your Boat - LEGO Town, Architecture, Building Tips, Inspiration Ideas, and more! The Ocean Blue - (BTT) While a lot of people can claim to have a house on the water, not a lot of people literally have a house on the water. It might be a pain to get the mail, and it certainly makes it more difficult to take the dog out for a walk, but you can't complain about the peace and tranquility that comes with your own private island, no matter how humble. An abundance of windows lets you soak in all the azure goodness you can take, and assures you'll never miss a sunrise or sunset on the watery horizon.